Pilotwings as it appears in Smash. ST01: Roll Out, Wonderful 100! Pilotwings (パイロットウイングス, Pilotwings) is a stage in Super Smash Bros. for Wii U and Super Smash Bros. Ultimate. The stage is set in the third level of Pilotwings and Wuhu Island, the main world of Pilotwings Resort. Combatants fight atop the wings of a red biplane as it flies through rings in the sky over a flat, 2D island. The top wings of the biplane serve as soft platforms, while the bottom wings are semisoft. The cockpit in the middle is a solid wall, splitting the lower half of the stage in two. The stage tilts as the plane makes turns in the air. After some time, the fighters will be dropped onto a yellow monoplane which flies towards and over Wuhu Island. The wings of this plane form a semisoft platform. The rotors below the wings can be stood on, but this is risky to attempt, as their edges cannot be grabbed. When players are launched, they may rebound off the terrain off the island, which may KO them but can also save them when they would otherwise have continued past the blast line. Miis can be seen flying with Rocket Belts from Pilotwings Resort. The yellow plane will eventually make its way back to the first island and drop players onto the red biplane, starting the loop over again. In Ultimate, the rotors of the yellow monoplane can be grabbed, making fighting in that area notably safer. The stage will also make a warning sound whenever the planes transition. In Super Smash Bros. for Wii U, the Ω form is set on a floating platform with the color scheme of the yellow plane which appears to have a design of aircraft structure at the bottom. Like Wuhu Island the stage tours the same area but take a different path. The planes can still be seen in the background. In Super Smash Bros. Ultimate, the main platform of the Ω form and Battlefield form is unique to these forms and aesthetically resembles the yellow plane of the normal form. It is also the same size and shape as Final Destination and Battlefield, respectively. The three soft platforms of the Battlefield form are metallic and are also unique to this form. As a stage named after its series, it originates from both Pilotwings for the SNES and Pilotwings Resort for the 3DS. The red biplane in this stage is the 'Light Plane' used in Pilotwings, and the flat, 2D island is the runway from lesson 3 of Pilotwings. The island is also in lesson 7, however, lesson 3 takes place in the daytime, while lesson 7 takes place at sunset. The yellow plane is modeled after the mono-wing sea planes used in Pilotwings Resort as it flies towards Wuhu Island. Wuhu Island first appeared in Wii Fit and Wii Sports Resort, and is also the main area in Pilotwings Resort. It also appeared in Mario Kart 7 as a track in the game. The island from lesson 3 as it originally appeared in Pilotwings. 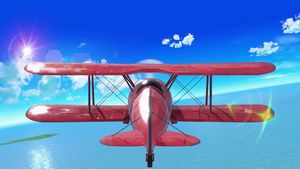 The biplane as it originally appeared in Pilotwings. 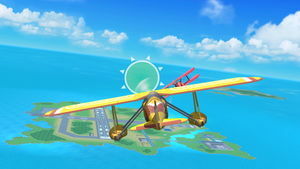 A plane flying towards Wuhu Island in Pilotwings Resort. Pilotwings is banned in tournaments due to powerful camping spots on both planes, especially the yellow plane's rotors, as well as due to KOs being caused or prevented by the damaging terrain and tilting of the planes. The planes can also impact a character trying to recover, as they can tilt at the wrong moment. Added 8-player mode version of the stage's Ω form. Aerial view of the island from Pilotwings lesson 3. Aerial view of Wuhu Island. Link and Samus atop a red biplane above a runway. Villager and Mario atop the yellow seaplane flying through Wuhu Island. Peach and Fox on the yellow seaplane flying near a bridge. The yellow seaplane flying near the 2D island. The Wii Fit Trainer lying prone on the red biplane. Mario, Pikachu, Bowser and Pit on the red biplane. Mario, Bowser, Donkey Kong, and King Dedede on the yellow seaplane. Bayonetta, Diddy Kong, Mega Man and Peach fighting around Alolan Exeggutor on the stage. A Super Leaf-equipped Luigi with Bewear on the stage. Pichu striking Wario with its up smash on the stage. There are some other small 2D islands spread across the ocean, although they never appeared in the original Pilotwings. The yellow plane from Pilotwings Resort has a full glass case over the cockpit, hiding whoever is flying the plane. The cockpit appears open in the respective game. The islands from both Pilotwings and Pilotwings Resort are portrayed as existing in the same area of the ocean, however this is not true as neither neighbouring island can be seen in each game. On the bi-plane section of this stage, the point rings take the form of the old design from the original Pilotwings, and as the stage changes to the yellow plane, the rings take on the new design from Pilotwings 64 and Pilotwings Resort. The Super Smash Bros. Direct incorrectly referred to this stage as "Pilot Wings". Wuhu Island also appears as its own stage, using the same model as this stage. These are the only two separate stages to share most of their background geometry aside from Battlefield and Big Battlefield. The SNES Pilotwings island is not visible on the Wuhu Island stage, however. This page was last edited on April 16, 2019, at 07:45.